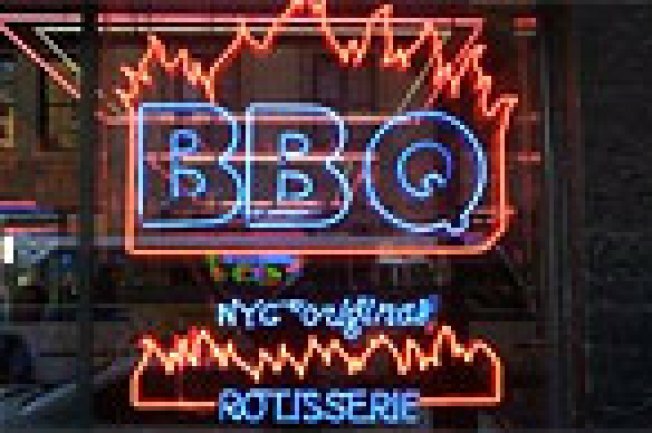 BBQ, the cheap liquid-smoke joint that previously fed NYU kids at 8th Street and University before the rent skyrocketed to what we're told was $75,000 a month, is reopening at 21 West 8th Street on Monday. Eater mistakes the place for part of the Dallas BBQ chain, but while it used to be affiliated, that partnership was broken long ago (a classic Gray's Papaya/Papaya King type situation). The difference will finally be evident thanks to new items such as a fried samosa, an Asian vegetable wrap, Oriental baby back ribs (take that, Anita Lo! ), and a Mexicano wrap (chicken, peppers, onions, cheese, chipotle mayo, and a bunch of other stuff, we're sure). The management tells us that prices will be even lower than they were before -- $10 will get you a rack of ribs with a choice of side, and $5 will get you a quarter chicken with same. And of course, the Texas-size drinks, priced at $6 or $7, will be in full effect. Meanwhile, Dallas BBQ has a kind of awesome recession special going -- $49.99 gets you two tickets for Amateur Night at the Apollo and dinner for two! Was Chopping Block Better Than Top Chef, and Was MPW Better Than Gordon Ramsay? Fat Duck Reopens; BK’s First Locavore Bodega?